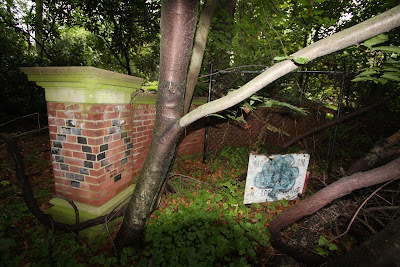 Buried deep in the woods and down a road that has been long closed off to traffic sits the original entrance and gates (minus the actual iron gate) to Stanley Mortimer's 'Roslyn House'. In 1919 Francis P. Garvan purchased the house and property. The estate has since been split up into numerous modern houses in a development called 'Stone Arches', for the stone arches that sit sporadically placed around the property. Today this entrance leads to nothing but overgrown trees and weeds. Click HERE to see where 'Roslyn House' stood before it was demolished in the mid 1970's. The sign dates to Garvan's time as owner of the estate and reads, "Mrs. F.P. 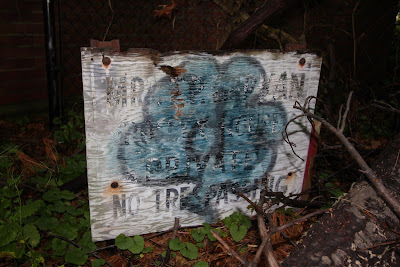 Garvan, Roslyn House, Private, No Trespassing". As an original resident of Stone Arches, I can tell you that the sign actually read "Mrs. F.P. Garvan, Roslyn House, Private, No Trespassing"